This article is up for deletion on Wikipedia and I believe it’s actually a pretty fun read and has some interesting “facts” that a lot of people mis-learn in school or are told wrong when they’re growing up. Anyway… copy/pasting it here in the event it gets deleted. I enjoyed reading it. In ancient Rome, Romans did not build rooms called vomitoria in which to purge themselves after a meal. Vomitoria were the entranceways through which crowds entered and exited a stadium. There is no evidence that Vikings wore horns on their helmet. There is no evidence that iron maidens were invented in the Middle Ages or even used for torture, despite being shown so in some media, but instead were pieced together in the 18th century from several artifacts found in museums in order to create spectacular objects intended for (commercial) exhibition. I ordered a few discs from DiscGolfCenter before Christmas. I didn’t have anyone recommend them to me and I hadn’t ever ordered from them before. I came across them while searching through Google for different discs. I picked up another Blowfly II (lost my last one…damn!) as well as a 10m Brick, Gremlin GM, and a Defender. Overall the experience was pleasant. The site is anything but visually impressive. It looks like a basic e-commerce site and has some convenient features like the “Top Sellers” and “Customers who bought this also purchased…” Adding items to your basket took me about 5 minutes to figure out and then I realized that there were instructions on each product page that tell you to click the numbers in the chart to choose your color and weight. This is a fine system and once I knew to do that – was extremely easy, but it took me a few minutes to figure out as I’d never seen a system like this.. it’s usually a dropdown menu or radio buttons and an “add to cart” button. The discs arrived relatively quickly and were boxed up nicely. Obviously that’s more of UPS’s deal, but DiscGolfCenter at least got them shipped out relatively quickly (next business day). I picked up this disc because I’ve seen it on several disc retailer sites but haven’t ever seen one in person or used one. 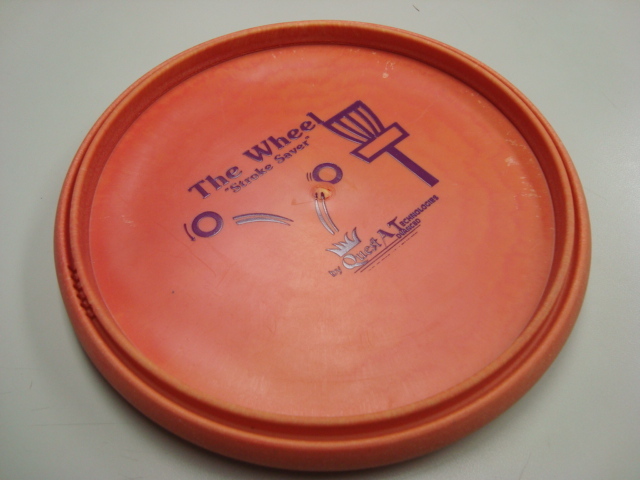 It’s basically a normal looking disc with a big buldge in the center – as you’d expect it to be from the photos… The idea is that you can lob it – like you would a brick or a stone underhanded – into the basket and it won’t catch flight half way there and veer off course and miss the basket by mere inches. I can’t say it’s my favorite putter – that designation might go to my Turbo Putt or something like the Blowfly II. Still – I’m glad I bought it because I like really unique discs (PDGA approved or not) that show someone was thinking outside the box when they designed it. Will I use it? Probably. More likely when I’m playing with new people so they can see how different discs can be from each other (example: The Wheel). 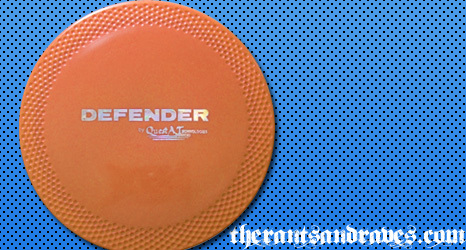 The Defender is another rather unique disc. It’s got little dimples along the edge for additional grip (and I assume the same theory of dimples allowing a golf ball to travel further was probably intentional, but I can’t say whether or not the principle applies to this disc or not). It was a bit “floppier” that I thought it would be, but isn’t near as floppy as say a Blowfly. 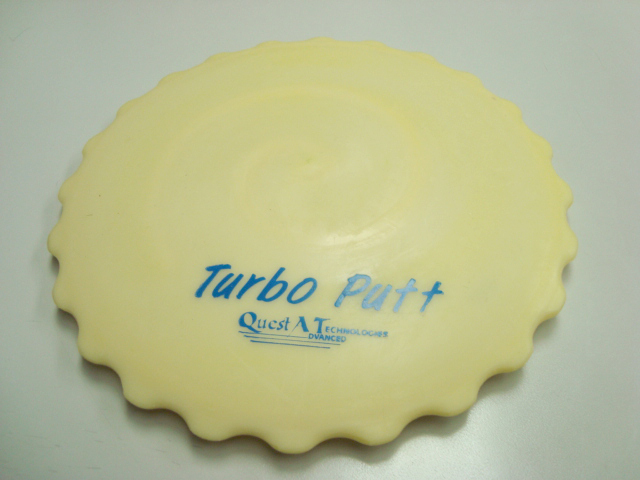 It’s made by Quest AT – the same guys that made the Brick above, but is a driver not a putter. They claim it to be the farthest flying driver on the market (if everyone who claimed they had the furthest flying disc actually had the furthest flying disc…). I don’t have any extremely long shots on my course, but I can say that the disc does go really really far and does it in about as straight a line as you can get. They say to throw it with a little hyzer and it’ll do it’s magic. It worked for me. I’m not sure if it’s PDGA approved or not. Will it replace my Nuke as my long-drive disc? Doubtful… but I’ll at least carry it around with me because it seems to be a lot more predictable than my Nuke is. The infamous Gremlin GM. The GM stands for Greater Midrange and is supposed to be a nice balance between a distance and a midrange disc. 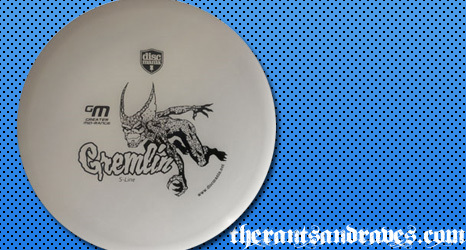 If you’re not sure which disc to use – pull out your Gremlin. This disc has been around for a long time in one form or another. 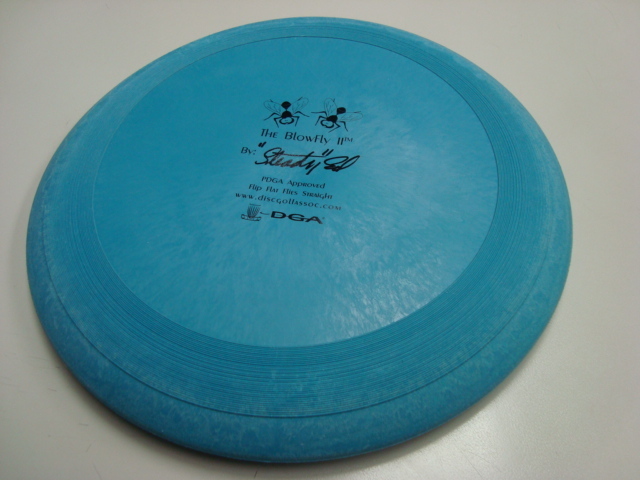 It was made by Innova for a while and is now produced by Discmania. If you’ve got a couple Sharks or any other cheap Innova discs that you picked up at your local Dicks Sporting Goods or something like that – replace them with the Gremlin and you’ll be more than happy. It’s got a nice grippy feel while at the same time being durable enough to not make you worried about nailing a tree and putting a nice chunk in your disc. I’ll definitely order another one of these soon and plan to have at least 1 on me at all times while I’m out on the course. 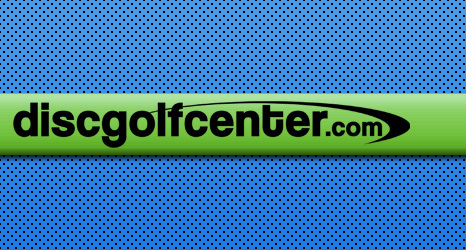 I’ve been suggested DiscGolfStation.com and will give it a shot next time I need to order some new discs. 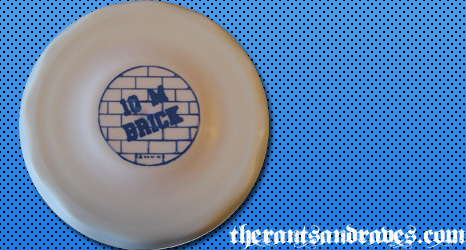 Keep any eye out for a review on their site as well as a few other disc impressions/reviews. Everyone using MediaTemple had an issue with their WordPress and other CMS installations a while back (Joomla, etc) and I thought it might’ve been a security hole in WP but it wasn’t. After I turned comments back on I forgot to set it to where I didn’t have to approve each and every one of them but I’ve fixed it now and comments should be appearing as normal when you leave one (there are a few anti-spam words that will flag it) but most of them should immediately appear. When I was looking at first cars in the 90’s the Wrangler always seemed like a fun teenagers vehicle to me but I shied away from them because of the rumors that they were extremely easy to flip and prone to rollover. Is this the case still? Was it ever the case? Are there any statistics that show that Jeep Wranglers are any more prone to rollover than say… Ford Explorers? Nissan Xterra? Edit: I also wanted to know about side-impact in the event of an accident when you have your doors off and get t-boned. 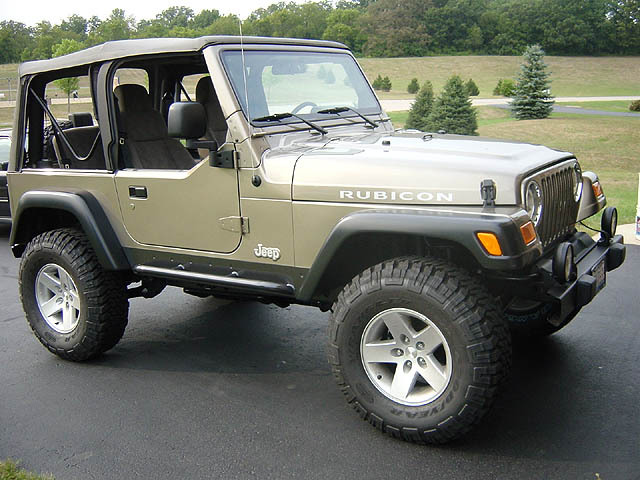 These guys (wranglerforums) offer some pretty good advice to a kid who asked on their forums about riding with the doors off. One member said that “they test them with the doors off.. ” but I know for a fact that’s not true because I happened to see the side-impact review on IIHS.org that said “During the crash, the driver door opened. This opening didn’t significantly affect dummy movement during the test but shouldn’t happen because, in some crashes, it could allow partial or complete occupant ejection, especially if the occupant is unbelted. This door opening resulted in a structure rating downgrade from good to acceptable.” They did however offer the advice of installing side rocker guards on for increased side-impact durability. “Rockers to add some strength to the side of the tub if that is his concern, and IMO, offer a better structural piece than the doors do.” (as seen on THIS picture – the tubes look pretty tough). 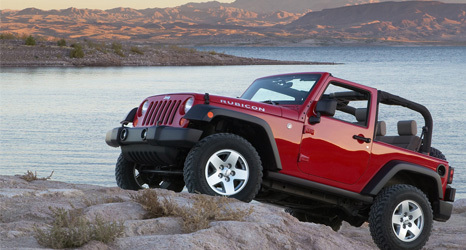 Edit 2: USA Today has a good insight into the rollover risks of Wranglers and competing SUVs. In NHTSA testing, no SUV has earned a top five-star rating. Under the ratings system, a vehicle with five stars has a rollover risk of less than 10%. A four-star vehicle has a 10% to 20% risk and a three-star vehicle has a 20% to 30% risk. 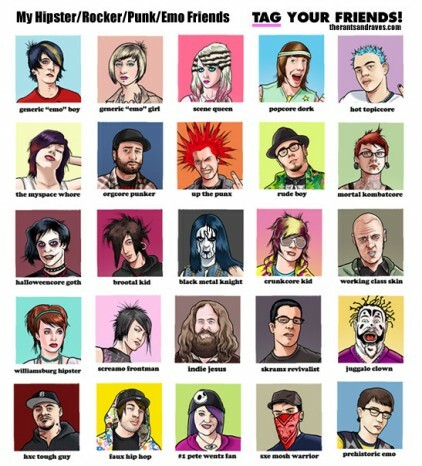 I know I bitched a lot about constantly being tagged in these but seeing as how less and less of my friends are doing it (dunno) I don’t really hate them as much any more. 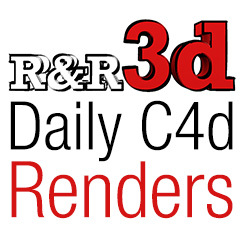 That and I’m getting 150+ hits a day on my last post where I complained about them – I’m going to sell out and put a couple more on here for people to download and use. Well there is and I found it. Where I got the file – About.com site on audio splitting. About.com is lame I know but it worked. You can split an mp3 several different ways like by section length, number of sections, etc. I just wanted to split up a DJ mix into several parts so I can put it on a CD and easily navigate through it without having to fastforward for 5 minutes to get to a part I like. Hope someone that ended up here needed something like it. Cheers!